Were the Witnesses to the Marriage an Unmarried Couple? If there are two witnesses to a marriage and you can “figure out” who one of the witnesses is, consider the possibility that the other witness was the significant other of the first witness. Or the other witness could just be a friend of the couple of which you are unaware. Your email subscription can be managed on this page. Email me at mjnrootdig@gmail.com if that does not allow you to fix any issues you have with your subscription. Wills, deeds, and other legal documents may list all the children of a specific individual. Don’t assume that they are listed in order from oldest to youngest. They may be–or they may not be. Try and use other records to estimate the years of birth for at least some of the children. That may give you a better perspective on whether they are listed in birth order or not. Registration is limited. More details can be found on our blog post. We are excited to be offering another section of my US Land Records class. Registration is limited. Additional details are on our announcement page. The maiden name given for my ancestor on her marriage record differed from the maiden name her children listed for her in their own records. Don’t conclude the children were wrong. While they weren’t alive when their mother was born, they may have had some knowledge of who her parents were and what her maiden name was. 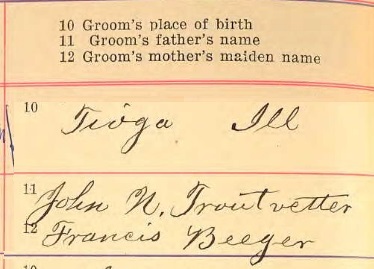 In this case, the name given on the mother’s marriage record was actually the last name of her step-father and not her actual father’s last name. Turned out her kids actually had the name right. What time period does the record cover? What was the purpose of the record? How did someone or something “get in” the record? How were the records originally organized and stored? If there is an index, is it a full-name index? Are there terms in the record that I don’t understand? There are other questions to ask about the record as you analyze the information it contains, but the answers to these questions will hopefully make your search easier. 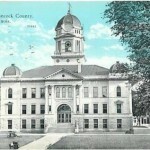 Ancestry.com recently added a database of fire insurance records from 176 8-1937 for Ostfriesland, Germany, to their website. I made a rookie mistake when using these records for the first time. I simply typed in names and did not read the description of the records. Do You Know Your Terms? When making a trip to a courthouse, taking a genealogical reference manual isn’t necessary. However, work in land, court, and probate records may go more smoothly if you have a list of basic terms and their definitions with you. Confusing terms such as grantor/grantee, defendant/plaintiff, administrator/executor, quit claim/ warranty, etc. may cause you to waste research time. 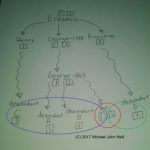 One of the biggest mistakes a genealogist can make is assuming that what is true today was true 150 or more years ago. Analyzing an 1850 era probate settlement by comparing it to an estate settlement in 1990 is not the best approach. Laws are different and procedures may not quite be the same. Contemporary state statutes (many of which are online at Google Books) should shed some light on practices and procedures during the time of interest.